Earlier today I saw Irina Netchaev tweet about how Mike Mueller, Jeff Turner, Jay Thompson and I were some of her “favs”, so I couldn’t help but be curious what she was referring to… Her link sent me to the type of poll that everyone loves to hate: A popularity contest where the “community” is able to vote on who are the most important in the real estate industry. Considering that after at least one day of the poll being live, none of the people have over 16 votes, I think it’s pretty safe to say the results are statistically meaningless and likely to remain that way. However, it did get me thinking about an update to the 50 most influential real estate people on twitter that caused quite the stir last fall… After publishing the list, I got to talking with Garron Selliken and Chris Lynch about how M Agents might be able to use such a tool, and so we build a web version of the process and started testing it out with some of the agents. A couple of agents found some great uses for it including one woman who focuses on Modern Homes in Portland. She used the tool to quickly identify and begin connecting with people relevant to her niche (i.e. modern homes) by simply identifying a few relevant people interested in the subject and then plugging them into the tool. And in only a few months of being active on twitter, Marisa has added hundreds of relevant people to her sphere on both a national and local level. 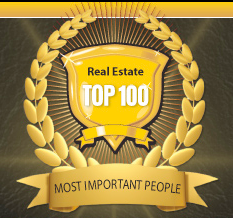 The way to think about this list is to read it something like this… Out of the top 100 people in real estate (as determined by the number of people in real estate following them), 89 are following Rob Hahn. In other words, instead of using a random sampling of people as most polls do, this list is created by the most influential twitter people in the industry! One of the more interesting things about the list is that when you get down past the top 50 people, non real estate people like Tony from Zappos, Chris Brogen and Gary Vaynerchuk start showing up… It doesn’t surprise me one bit that a decent percent of the influential people in real estate are following these folks, so it makes good sense. In terms of the web process I developed last fall, we made one improvement when we turned it into a web app… Instead of using the top 50 people, we made that a variable and I tend to use 100 people as the basis for relevance since the results are much more granular. And if you missed the discussion on the algorithms used to create this list, check out this post for background. And I wish I could add a link to the URL so you could run it yourself, but it was built to only handle one process at a time, so it could get ugly if multiple people wanted to play at once. Posted on March 3, 2010 Author Dustin LutherCategories Marketing Tools, Real Estate TechnologyTags app, blog, iphone, post, wordpress4 Comments on Publishing from my phone??? I’m always get excited before heading out to an Inman event… The team at Inman has always made sure I get some great visibility through speaking and moderating panels, and truth be told, I simply have a blast meeting up with all my real estate friends. This year is no different, they not only have me speaking about Facebook, but I’m also moderating a technology and media track where I get to host conversations with industry leaders on mobile, wordpress, twitter, and the extendable web (How cool is that???). This year, we’re also going to be running Spinnio interviews out of the Inman booth on Wednesday. So far, we’ve got Craig Newmark and Brad Inman confirmed and the Inman team is sure to line up some other great guests over the next few days! Maybe even cooler, Kris Berg is scheduled to host all the conversations!!! She really is one of my favorite people in the whole world, so I couldn’t be more excited. What’s up with Spinnio anyway? Why not just live stream the events? I know I’m a bit biased since Spinnio is my baby, but what excites me (and obviously a few others) about Spinnio events is that they’re meant to get YOU engaged. Using either Facebook chat or Twitter, you get to ask the questions of the guests… You get to banter with them… We’ll be actively monitoring the live streams from both Facebook and Twitter, so getting involved really is simple. Spinnio really is different. It’s not the usual “live streaming” of interviews or conference sessions. We’re letting you ask the questions of real estate and technology leaders… and all you have to do to take part is to show up at the spinnio event landing page on Inman on Wednesday. Posted on January 8, 2010 Author Dustin LutherCategories 4realz Speaking and Presentations, Events, Real Estate Technology, SpinnioTags conference, Craigslist, icny, Inman, interview, nyc, Spinnio1 Comment on Nothing like an Inman event in NYC! And where have you been??? So, I’ve been pretty silent over here lately, but that’s only because something had to give or I’d go nuts. But since I’m so darn silent here, I thought it’d be appropriate to let you know where I am active! This is one of the most active communities I have going right now. This is where I start conversations by sharing links that I find interesting from around the web. Become a fan of my page follow along! This is not only one of my favorite consulting projects I’m working on, but also where I’m starting to post all of my “social media” type posts. If you’re interested in talking social media strategy, then join me over at the Socially Wired blog where I not only talk about social media strategy, but I’m describing the progress of implementing a social media strategy at a regional newspaper. As I’m JUST starting to ramp things up there and expecting a lot of posts on using social media to drive business in the very near future! Always my early love, the Seattle community on RCG is as strong as ever. But not only that, I recently teamed up with some folks from M Realty to add a rock’n home search tool to the site. If you haven’t checked out RCG lately, definitely head over there to see how we continue pushing the boundaries of what a local real estate community website can be. This is my “entertainment” start-up where I’m hosting Facebook conversations with interesting people in the movie industry that’s gotten out of control lately. In the month or so since I launched the tool, I’ve hosted conversations with directors, writers, actors talking about movies like The Stoning of Soraya M, Food Inc and Humpday. Our next conversation is with Ric O’Barry of The Cove on Tuesday! Definitely consider joining us and become a fan of the Spinnio Facebook page to get updated about movie events, news and stories! And of course, I love to banter on Twitter, but keep your expectations low for anything of value out of me over there! And I might as well make it easy for you… You can follow along with another of these projects right from this post! Posted on August 7, 2009 Author Dustin LutherCategories 4realz Speaking and Presentations, Digital Marketing Strategy, Facebook, Innovation, Marketing, Marketing Tools, Real Estate TechnologyTags newspaper, real estate, seach, star, tools, ventura3 Comments on And where have you been?? ?